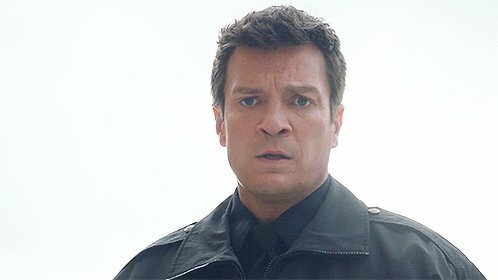 As Castle Season 8 enters its final stretch, the yet-to-be-renewed ABC drama is facing two different finales and three possible futures. And if Castle does return for Season 9, it could look one of two ways: like the show that fans currently know, or a variation that accounts for an altered cast. Or, of course, you have the worst-case scenario — that Castle doesn’t come back at all, after a season that occasionally flirted with series-low ratings, yet in recent weeks has stabilized and even upticked. “—because our hope is that it never airs,” Winter adds. Hawley traveled a similar road last year at this time, when as co-showrunner of The Following he set up a finale that ended with Kevin Bacon’s character venturing off to be a vigilante of sorts, as the Fox drama rode the renewal bubble. “But we can’t do that on Castle,” he says. “Castle‘s a different show, so it felt like to be fair to the fans, if we thought there was even a small chance we wouldn’t come back, we owed it to them to craft something” that offers closure. Until ABC hands down its fateful decision, the showrunners have their “fingers crossed” that Castle does come back, and “with the whole team.” But when exactly do they need to know which version of the finale to submit for broadcast on May 16? Pre-order Castle “The Complete Eighth Season”!